Gypsum, a natural mineral mined all over the globe, is an inexpensive, safe soil additive that can break up compacted earth. Commonly used in lawn and garden care, the mineral is safe and effective but also a source of controversy in the agriculture and gardening industry. ?? A byproduct of sulfide oxidation, gypsum is also known as hydrous calcium sulfate, satin spar and selenite and is mined domestically in Oklahoma, Iowa, Nevada, Texas and California. Gypsum is most commonly used in wallboard manufacturing (Sheetrock) but is also the primary ingredient in chalk, plaster of Paris and Portland cement, and is used as an additive in tofu. A significant portion of the gypsum market is the agriculture sector, including its use by home gardeners. Gypsum breaks up compacted soil for better drainage, and contains calcium and sulphur, both of which aid plant growth. ? Gardens with clay soil will see the greatest benefit from a gypsum application. The grounds around new homes are often compacted by heavy machinery, and building code requirements often demand soils be highly compacted to support building foundations. In addition, fill dirt often imported to level out a new yard may contain unwanted clay. Applications of gypsum over a three-year span will break up the clay, soften the soil and allow for better drainage. Gypsum contains no plant nutrients and is not considered a fertilizer, so gardeners do not need to worry about burning garden plants with an accidental over-application. Unaffected by sun or cold, gypsum can be applied at any time of year. Gypsum is nontoxic and safe for use around children or pets. Gypsum is milled into several forms, with granular being the best choice for garden use. On lawns, a broadcast or drop spreader is suggested, with a setting that will apply 40 pounds per 1,000 feet. In a garden, simply distribute a handful at a time by holding the grains in a loose grip and flicking them evenly across the garden as if dealing playing cards. Don't bother working gypsum into the soil. Instead, just water the garden well and allow the grains to dissolve and leach into the soil naturally. Although gypsum is organic, nontoxic and inexpensive, it is not uncontroversial. The Agriculture Center at Louisiana State University considers gypsum wasteful and unnecessary on most soils because of the common mixture of non-native and native subsoils in most backyard gardens. Layered soils show little effect from gypsum, as they are already loose. 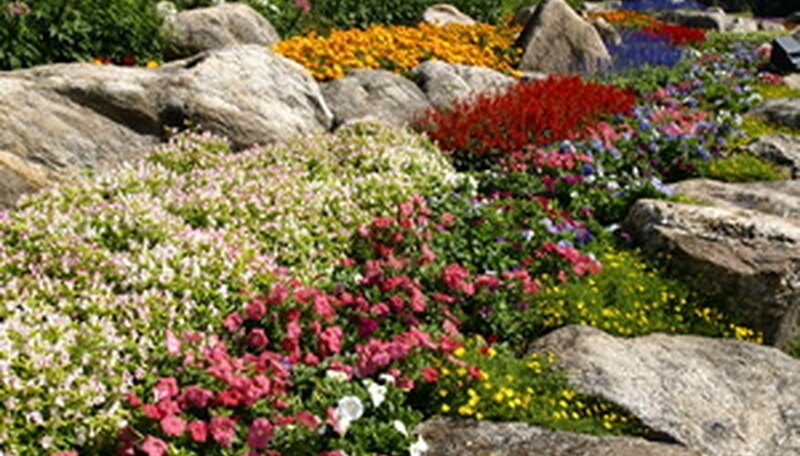 Additional arguments contend that although pure gypsum is neutral and does not raise soil pH, many gypsum products are impure and may contain dolomite, which will raise soil pH, possibly creating an adverse environment for a garden.